House and time at Malvern: Sch, 1906 - 1910. Died: 08 July 1916 aged 24 in France. Died of wounds. Son of Horace Arthur and S. Kate Fisher, Arno Vale, Nottingham. b 1892. Modern III - Upper Shell. House Prefect. Trinity College, Cambridge; B.A. (Third Class Theological Tripos). Great War, Inns of Court O.T.C. 1914; Captain Sherwood Foresters.D.S.O., Despatches. 'The fourth and youngest brother of a School House family, John Wilfred Fisher throughout his school career was a sound and trustworthy boy, full of quiet purpose. 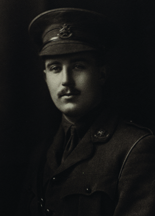 The following extract from the "Times" shows how he rose to the occasion, and what a loss he is to his country: "Captain John Wilfred Fisher, D.S.O., Sherwood Foresters, died of wounds on July 8. He joined the Inns of Court O.T.C. in August 1914, obtained a commission in the Sherwood Foresters, and went to the front a year ago. Captain Fisher won the D.S.O. in March for conspicuous gallantry, the official record of his conduct being as follows: 'When the enemy blew up a portion of the front trench he drove off their attack and skilfully organised the defence. He continued fighting long after he was wounded, and set a fine example to all around him.' Captain Fisher, who was mentioned in despatches in April, had been four times wounded within nine months—the last time fatally." ' (Malvernian, Jul 1916). He was wounded at Sanctuary Wood, Ypres, Belgium, 30th October 1915 by a German sniper and rejoined his battalion 11th December 1915 at Ypres, when he took over command of "D" Company. He was wounded again 16th February 1916 at Ypres. He was awarded the D.S.O. with the following citation: "For conspicuous gallantry on the 14th February 1916, near Ypres/Commines Canal. When the enemy blew up a portion of the front line trench, he drove off their attack and skilfully organised the defence. He continued fighting long after he was wounded, and set a fine example to all around him". He was again wounded when in the Quadrangle support line near Contalmaison on the Somme, France, 7th July 1916, and died the following day.